The main beach in Corfu Town is just under 1.5 miles along the coast, and is a small, public, man-made shingle beach for which there is a minimal entry charge. However, there are a number of other beaches within close vicinity which tourists tend to visit due top their spectacular views. Without doubt the jewel in the Ionian crown, this really is one of the most beautiful and fascinating towns in the Greek islands. It’s certainly busy – 40,000 people live here before the tourists even arrive – but it’s well worth a visit to check out the way different cultures have left their influences over the centuries. Take a stroll through the extraordinary paved alleyways and explore the maze of streets and squares to get a real feel for the place and its complex history. The Old Fortress, which stands 0n a twin-peaked headland on the eastern side, was started by the Byzantines in the 6th century. The Venetians took over from 1386 to 1797 stamping their architectural mark on Corfu town with multi-storey buildings and characteristically narrow streets (kandounia) and the French made a stunning contribution by building The Liston, an elegant arcade, around the end of the 8th century. Of course, us Brits have left an impression too – not least by introducing Corfu Town to cricket and ginger beer for the first time when the Ionian islands came under British protection in 1815. On the Spianadha (Esplanade) you can find Greece’s oldest cricket ground where spectators can still join players to drink ginger beer made to an original Victorian recipe! Although Corfu Town fell victim to Nazi bombing raids in World War II and suffered extensive damage, major renovation work for the European Union summit held here in X994 has restored this beautiful town to its former glory. The red dome of Aghios Spyridon Church is possibly Corfu Town’s most famous landmark. It’s also home to the ornate casket holding the mysteriously preserved remains of the Island’s patron saint whose embalmed body is paraded through the streets four times a year. According to Iegend, St Spyridon regularly slips out of the church for a stroll around town and to save wear and tear on his embroidered slippers they are replaced every year. The people of Corfu believe the saint has repeatedly saved their bacon -from a famine In 1553 and several other plagues and invasions – and literally thousands of Corfiot children are named Spyros In his honour. You’ll find the church one block behind the Liston in Aghios Spyridon square. Open dally gam to 2pm, admission is free but visits during a service are discouraged. The Palaio Frourio – or Old Fortress – dates back in part to the early sixth century. From 1550 the Venetians extended the fortifications and dug a moat but many of the buildlngs’ inside were built by the British for military use, including St George’s Church in 1840. The entrance is from Esplanade Square and the church is open Tuesday to Sunday 8.30am to 3pm and closed on Mondays. The Neo Frourio – or New Fortress – can only be described as ‘new’ if you consider 1576 as recent It is made up of a complex arrangement of cellars, dungeons and battlements which are great for exploring. Spectacular views from the top, as well as a small gallery and cafe, make the steep climb up a metal staircase worthwhile. Open dally from roam to 4pm depending on the time of year, the entrance is just after the Tenedos church in Solomos Street. The Liston, a row of arcaded buildings built by the French, overlooks the Spianadha and Is still one of the main places to see and be seen. It’s home to a large number of upmarket cafes where Corfu Town’s young and old, as well as tourists, come to take their morning coffee or enjoy an evening stroll or ‘volta’. The recently restored Mon Repos is an elegant villa built for the British High Commissioner, Frederick Adam, In 1824. It later became a summer residence for the Greek royal family and Prince Philip was born here in 1921. The estates wooded grounds are well worth a visit and though not sign posted, you can gain access through the green iron gates opposite the ruined Palaiopolis basilica. The octagonal-domed Church of St Jason and St Sosipater is dedicated to the two bishops who brought Christianity to Corfu during the 1st century. It’s open all day, every day, admission is free but donations are welcome. Visitors should keep covered up as bare legs and arms are considered disrespectful. To get there when walking back from Mon Repos to Corfu Town, take a left turn before the Marina Hotel. The Achilleion Palace is a colourful and exotic villa which attracts a huge number of coach tours. Built for Elizabeth, Empress of Austria, who told her architects “I want a place… worthy of Achilles” (hence the name) it was used as the location for the James Bond film For Your Eyes Only. The Empress lived in the palace until her assassination by an Italian anarchist in 18g8 when it was bought by Kaiser Wilhelm II The terraced gardens are particularly impressive with excellent views over the town. Because of its popularity, the palace is extremely busy between gam and midday. Try to go early – it opens at Sam – or later in the afternoon as it doesn’t close until 7pm. The Palace of St George and St Michael looks rather like an English stately home and was originally built for British High Commissioners to live in. It is now home to the Museum of Asiatic Art and Municipal Art Gallery. The palace is open Tuesday to Sunday 8.30am to 3pm. The British Cemetery features some remarkable military memorials including one marking the death of 44 seamen killed in a naval incident in 1946. Even so, it’s a quiet and peaceful place to stop for a moment and in spring and summer is full of wild orchids. The cemetery is south of San Rocco Square and open all day, every day. The Byzantine Museum is housed in the restored church of Antivouniotissa and is home to a particularly fine collection of sculptures, religious artefacts and 15th to 19th century icons. It also boasts a picturesque little garden with its own bell tower – you’ll find it just off Arseniou Street. It’s open Tuesday to Saturday 8.30am to 3pm, Sunday 9.30am to 2.30pm. If you’ve ever fancied seeing a real Greek wedding, head for The Greek Orthodox Cathedral close to the old port which goes marriage-mad during the summer months. The arcaded avenue of Nikiforou Theotoki, situated west of the Spianada, is the place to go for olive wood, jewellery and clothes. The Corfu Leather Market has stacks of good-quality leather goods – from belts to bags – at reasonable prices. It’s near the old port, on the corner of 7 Dona Street and Nikiforou Theotoki Street. For beautiful, if pricey, replicas of ancient sculptures as well as some more affordable glass bowls and kitchenware, try Hercules Vlachos, an upmarket craft shop set one street back from the Liston. The stylish Kamidron on Nikiforou Theotoki offers a chic and unusual range of goods including chunky handmade silver jewellery with a designer touch, shoes from Bali, summer dresses and wind chimes. Terracotta specialises in the work of contemporary Greek artists and sells unique and exclusive items of jewellery as well as wall hangings and statues. Whilst undoubtedly the place to go for something special, prices are not as high as you might think. It’s on Filarmonikis Street. There’s nothing like a trip to the local market to find out what a place and its people are really like. Get up early and head for the fruit and veg market in the moat of the new fortress. It’s worth the effort just to see the old Corfiot ladies making sure they get a bargain. Open Sat to 2pm and closed Sundays. Opposite the cricket ground you will find the Espianada jewellery shop specialising in fine quality handmade jewellery. To mingle with Corfu Town’s young and fashionable set, hang out in Cafe au Chokolate, a very trendy Liston cocktail bar. Enjoy a meal at Aegli Restaurant on the Liston the most unique place in Corfu town. Located on the elegant Liston, this restaurant has been offering Greek and International cuisine cooked in the traditional way for over 4o years. If you feel like a break from Greek salads and moussaka, treat yourself to an Italian meal at the up-market and rather romantic II Giardino. Near the Archaeological Museum and open in the evenings only. The views from the candlelit roof terrace of Hotel Lavaliere on 4 Kapodistriou Street make it worth the little bit extra they charge for their cocktails. Pizza Pete serves superior pizza and delicious oven-baked prawns in a spicy tomato sauce. It’s on the main road past the old port. The oldest restaurant in old Corfu town just behind the cricket square. They serve all the best Greek specialities. 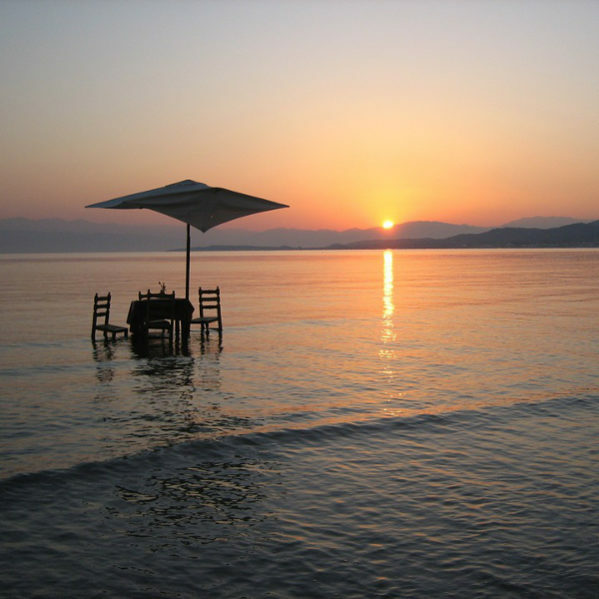 Corfu Town has a host of bars and restaurants for guests with a spectrum of tastes. The main street in Corfu Town is where the main selection of restaurants is situated al fresco, which provide a hub of activity early and late evening. For those guests wishing to dance the night away, Corfu Town will not disappoint, there are a number of bouzouki nightclubs, discos, bars and tavernas, which will provide entertainment into the early hours of the morning! The very pretty circular harbour is a lovely place to while away some time and, as Kassiopi is still a working fishing port, it’s an interesting one too. Steeped in history, Kassiopi’s past goes way back. There was a prehistoric settlement and a Corinthian city here long before the Romans moved in. Kassiopitissa Church stands on what is said to be the site of a temple of Zeus near the harbour Built in 1590 it contains a fascinating painting of a boy who was blinded as a punishment for stealing some wheat with two friends. He took refuge in the church where he only discovered his sight had been miraculously restored when he saw the church candle go out. Take the path opposite the church’s bell tower and you’ll find yourself at a ruined Byzantine fortress. The entrance, almost hidden by wild flowers, leads you to a vantage point offering spectacular views over Kassiopi’s bay and up to Mount Pantokrator Set sail at sunset to tour past the pretty bays of Kalami, Kerasia and Kouloura then stop for dinner in Aghios Stefanos on the east coast. Greece is famous for its handmade lace and embroidered cotton – and there’s lots of choice at Agathi’s Lace Shop. You know the exquisite lace and embroidered tablecloths at Aleka?s Lace House are the real thing because you can watch the women at work as they make them. The lace tablemats are a real bargain. Find it on the east of the harbour mark. Herbs and spices, olive oil and gifts – the large Kiros supermarket has everything. The smell from Nikolas Bakery is so wonderful that tourists and locals alike queue up to sample its delicious chocolate doughnuts and savoury ham and cheese croissants. The Underground Shop has all sorts of souvenirs – from chessboards with hand-painted pieces to wooden jewellery. Uncle Simos is a restaurant with history! A Mediterranean kitchen including traditional Greek dishes – everyone is welcome. At Janis the hospitality and the excellent food is not just a myth. The combination of sea – sun – unique and delicious dishes will make you have an unforgettable romantic time. Bustling and busy, Kassiopi Star offers good value set menus and delicious mezedes like filo pastry parcels filled with spinach and mussels. It’s set back from the harbour, opposite the supermarket. You’d never know today that Limani’s used to be an ammunition store for the Germans during World War II. It’s now a pleasant place on the harbour’s edge for a simple snack, ice cream or after-dinner drinks. Porto is one of Kassiopi’s oldest restaurants and fish is its speciality. Try the bourdetto (chunks of fish in a tasty sauce). You’ll find it on the harbour near to The Travel Corner. Three Brothers on the harbourside offers great service and traditional food – including an excellent choice of Corfiot specialities plus fresh fish and lobster. To get away from it all for a moment, make your way to Time Out and find the pretty patio garden above its main bar. The views ace stunning – of both the harbour below and Albania in the distance – and you can take it all in over a sandwich or game of pool. Wish your local pub could be transferred to the middle of Kassiopi? Look no further than Angelos. Actress Joanna Lumley was once spotted in the Harbour Bar and no wonder. It’s a lively venue playing music from the 1960’s, as well as more current hits, and also has a pool table and satellite TV. You’ll find it on the harbourside near Aleka’s Lace Shop. Party till late at Illusions, an English-style pub which boasts Scouse DJs, chart and house music and karaoke. It’s on the corner of the harbour square. By day, Visions Music and Cocktail Bar is a laid back cafe but at night it comes alive. It’s on the main street, almost opposite the main square. Sidari beach runs parallel to the main road & boasts terracotta sand and shallow water. The Canal d’Amour is Sidari’s star attraction. 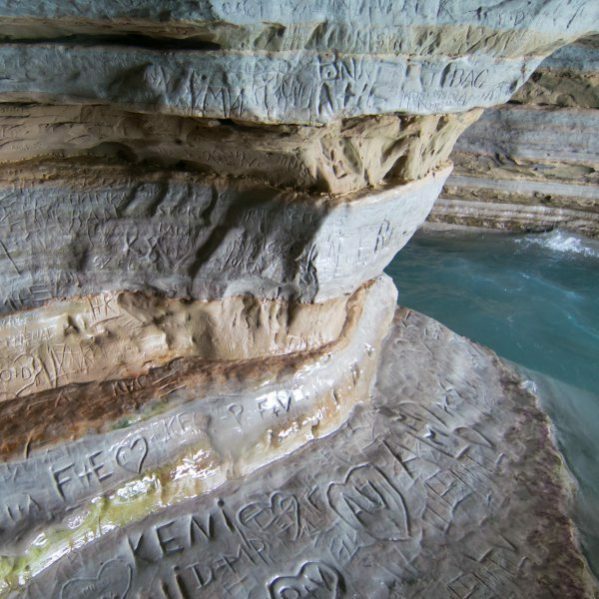 A rock formation in the shape of an arch, though this has long since crumbled away, legend has it that any woman who swims its length will win the man of her dreams. This area also has several sandy coves enclosed by rocky gorges. Watch the sun go down at Sunset Beach and you’ll agree that this stunning spot, with its narrow strip of sand and towering cliffs, more than lives up to its name. A few kilometres west of Sidari, It’s quiet and romantic here though there are no sunloungers or parasols for hire. The dramatic wind-carved sandstone cliffs which wall the delightful little coves lying just west of Sidari, provide a breathtaking backdrop to this bustling resort. Not so very long ago, this was a sleepy little place made up of little more than a village square surrounded by a cluster of pretty cottages. Today, it’s a popular holiday destination for families who like the fact that everything they need is within easy reach. The main beach is long and roomy, great for children and has a variety of watersports. There are also plenty of bars, restaurants, tavernas and extremely well sucked shops to visit. In Sidari, you can choose the pace which suits you. It tends to have a relaxed, laid back feel during the day and in the evening the streets are full of families taking a stroll and sampling the roasted nuts, cakes and ice-creams on sale at the shops and stalls. Later at night, the resort really begins to buzz and though there are stacks of lively karaoke and dance bars to try, there are also plenty of quieter restaurants and beachside bars. A bike is a great way to see the countryside around Sidari that many holidaymakers miss. Simply amble through quiet lanes and olive groves for the day at your own pace or take an energetic12km guided cycle tour to really cover some ground. There are pony treks available too. A motorboat is a great way to see the beauty of the northern coastline. Contact the Yellow Boat Company, on the beach or at the office. The Sidari water-slide is a big hit with children. Parents like it too for its cheap entrance price, free sunloungers and parasols. A snack bar sells sandwiches, spaghetti and drinks. For some fast and furious fun head for Sidari Go-Karts, near the BP garage. Adults can choose between low or highpowered karts and there are mini-karts for kids under five. The delights of Corfu Town are an easy bus ride away-they run regularly from Sam to 7.30pm every day except Sundays. Or head out to the pretty fishing village of Kassiopi on one of four buses a day from 9.30am onwards, except Sunday. The bus stop is by Theo & Billy’s Bar. Beautifully crafted, but often expensive, ceramics are Achaia’s forte. The stunning seven-piece mezedes set comes in the higher price bracket but the cheaper, multi-coloured pitcher with goblets is lovely too. Tassos and Bill has fur-lined suede slippers and leather gloves at unbelievably low prices – as well as a range of belts, wallets and bags. Wood and Stone has lots of cheap and cheerful nick-hacks to take home including wooden toys, hairclips and smooth shiny quartz. There are more expensive gifts too like olive-wood bowls, pots and vases. Artopolis Bakery is paradise for those with a sweet tooth and its huge honey soaked croissants and lemon pie will break even the strongest wills. Sit on Costas’ Bakery’s side veranda to enjoy a coffee and pastry. Everything but the food and drink is free at Amadeus Bar – which has a swimming pool, Jacuzzi, pool tables, karaoke and satellite TV. The Bolero is a cross between a pub and a garden bar and serves English food with a good vegetarian and children’s menu plus a few Corfiot specialities. At 10pm, the place comes alive to the hits of the 60s and 70s. Nightly karaoke sessions mean everyone gets the chance to sing along. Venezia is an original Italian restaurant with Italian dishes and a variety of pizzas baked traditionally in a wood oven. The menu also includes tasty starters, juicy salads, divine deserts and a range of Italian, Greek and house wines. Baze Sports Bar & Cafe show all sporting events on large screens whilst serving scrumptious breakfasts, snacks and main evening meals. The Hawaii grill and bar serves Greek food, fresh fish and ice-cream. Moussaka-edout? Try the Hong Kong Palace for a change of culinary scene. It also does takeaways but is only open for dinner. Margarita’s serves a mean steak and Corfu specialities too. Dishes like the feta cheese special – tomatoes, onions and baked cheese wrapped in foil – are among many cooked with the freshest ingredients at the Oasis Restaurant. Watch the world go by from the front terrace of Sidari’s oldest taverna, The Olympic. For a more secluded experience, slip on to its rear terrace for meals like squid, fried peppers, aubergines and oven-baked cheese but keep an eye on the waiters – they’re prone to sudden, unannounced bursts of Greek dancing. If cheap cocktails and big portions aren’t enough, Paradise has Greek dancing, lively music, pool tables and video games. Slick waiters who combine professional service with Zorba the Greek dance routines make Three Little Pigs an entertaining venue for traditional Greek food and international dishes like Chinese spare ribs. Try the Arena beach bar for a daytime baked potato, chip butty or ice-cream. Or go there later for cocktails and karaoke. Happy hour is from 7pm to 9pm. Calypso’s is an enormous bar where you can watch the latest film, enjoy a quiet beer or cocktail or dance your socks off. It also has a terrace leading down to the beach. For house, rave music and a wild night out, go to Oh La La’s where drinking races, boozy games and beach parties are all part of the fun. Palazzo is one of Sidari’s busiest and most happening bars. Visit it as part of the Bar Street Blitz night out. See your representative for details. For a late night, fast food fuel-up try the very popular San Remo, next door to Mint Club. At midnight the Tequila Bar really comes to life and loud dance music keeps it heaving until 3am. This is not a place to let on you can’t stand the pace – one yawn at the bar will see a tequila stammer with Tabasco sauce heading your way, whether you like it or not! Theo & Billy’s traditional English bar has entertainment every night, great atmosphere and English DJ. The bar also has Karaoke, satelite TV, pool table and movies shown daily. Famous for the wide range of cocktails and with Murphys, Tetleys Bitter and Caffreys on draft. Venus attracts the over 30’s like nobody’s business – drawn by the subdued lighting, pre-1985 music and wide selection of beers, including Guinness. The fun and fizzing nightlife at Faros is characterised by English DJs playing disco classics from as far back as the 60s as well as karaoke and cabaret acts from the UK. By day it’s an altogether quieter restaurant and beach bar. Mint-which can hold 500 people opens nightly during the summer for fun filled evenings of dance and pop music. Entrance is often free for ladies. Caesar’s – can hold 1,50o people -opens throughout the summer, also has an open-air garden bar and plays dance music from midnight till dawn. The main sandy beach shelves very gently into the shallow turquoise sea, making this an ideal spot for famines. Lying at the northern end of along bay, the setting is spectacular with a beautiful backdrop of green hills and olive groves with excellent views of the little island of Kravia. Here you have the opportunity to parasail, water-ski and windsurf or you can hire pedalloes and canoes. If you fancy doing a spot of shopping why not visit Ina’s Tourist and Gift Shop where designer tshirts, wraps and multi-coloured sarongs are all available at good prices. The best way to explore coast and mountains is by car, with Aghios Stefanos and Corfu Town not far away. Experience horse riding through the valleys, hills, olive groves and the beach. Just enjoy the surroundings. Suitable for all ages, beginners and advanced riders alike. 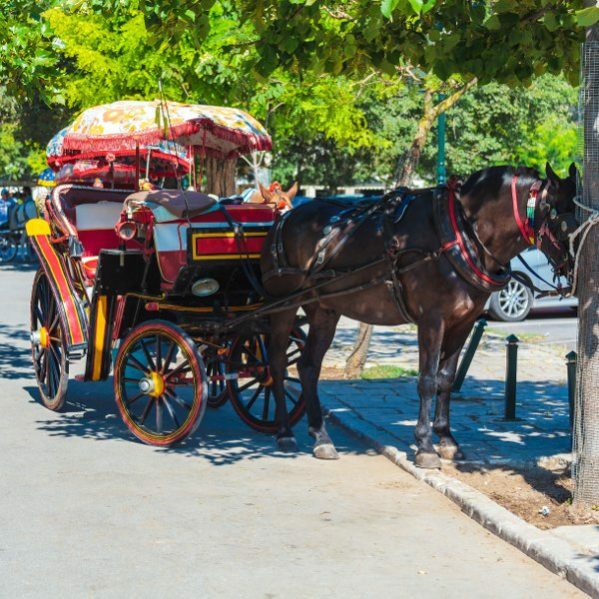 There are coach trips to other parts of the Island including Paleokastritsa and Kassiopi, as well as a grand tour of Corfu and a shopping trip to Corfu Town. Why not take one of the boat trips on offer to the local islands of Mathraki and Ericussa as well as trips further a field to Paxos, Antipaxos, Kefalonia and even Albania. You can enjoy a trip in the Calypso Star, the glass bottomed boat, and see the fascinating under water world or if you’re really adventurous you can try scuba diving. There are several tavernas selling all types of food in romantic settings serving traditional homemade dishes – specialities being fresh fish and grilled lobster. The nightlife can be found along the main street where the bars host discos and karaoke. A busy and bustling resort, Dassia is getting quite a reputation for its watersports including waterskiing, parascending and scuba diving. Its long shingle beach with good stretch of shallow water means it’s also good for young children. Take a tour of the beachside jetties to find out what boat trips are on offer. 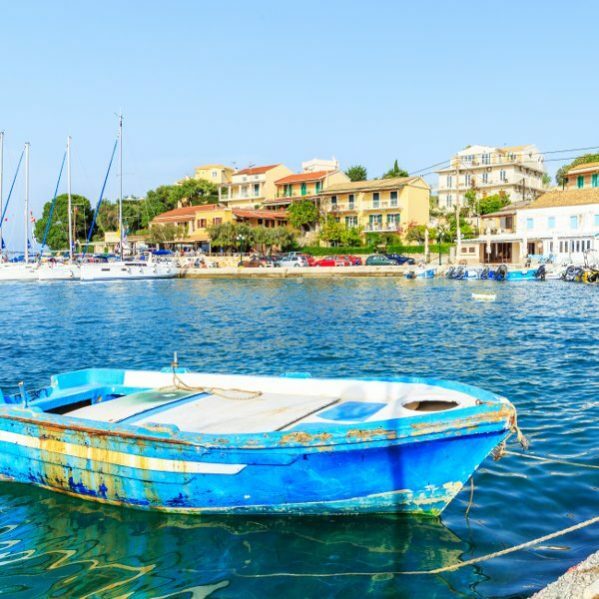 Choose from a minicruise past the resorts of Nissaki, Kalami and Kouloura, pop over to see the sights and shops of Kassiopi or head south to Benitses past Corfu Town. Details are available from your representative. Get on your bike and do some real exploring! Hire one from the Corfu Mountain bike Shop near the Elea Beach Hotel and head off alone or take one of their guided tours. If you avoid the heat of the day, walking can be a lovely way to see Greece – why not take a 2km stroll to the nearby resort of Ipsos or go inland to the village of Kato Korakiana. Dassia has jewellery shops in abundance with something for every budget. Just Leather has everything from the cheapest leather belts to expensive briefcases. You’ll find a suitable present for every member of the family at the Olive Wood House where gifts range from backgammon boards to walking sticks. Get the designer logo without the designer price tag at Santa Barbara Clothes Shop which sells fake Tommy Hilfiger and Calvin Klein. You’ll find everything under the sun – and more – at the enormous supermarket at the Ipsos end of Dassia It has a green grocery, leather shop, souvenir shop, bakery, clothes and beach section. At the Damon supermarket you will find a wide range of English novels and current magazines. For fake designer handbags plus leather goods, clothes and ceramics at reasonable prices, Yannis Leather Shop is worth a look. Avalon’s is a typical Greek taverna serving typical Greek fare – with some less than typical Greek dancing thrown in! With its stone arches, pots of flowers and romantic lighting, Dionysuos taverna is an intimate spot to enjoy some excellent meat dishes and delicious liqueur-laced desserts. For a special occasion and a change from Greek cuisine, Etrusco’s menu leans heavily towards Italian dishes. Extremely popular, it’s advisable to book. Turn off the main Dassia to Ipsos road near Sophia’s Comer, then follow the signs. The traditional and hugely popular Walnut Tree Taverna (Karydia) Is a must for Corflot and Greek specialities including spit roasted goat! Dance till 4am at the popular Edem Bar which has a nightly English DJ Located at the sea – follow signs for Hotel Elea Beach. Summer Moments, at the Corfu Town end of Dassia, serves giant cocktails packed with fruit and when you’ve sampled a dozen, you get a special glass to take home as a memento. Young people like Viva’s pink and white bar because it plays great music. which turns into a pebble beach towards Acharvi. The water is shallow for a long way and so calm it is almost lake-like, so safe for children. For a change of scene, take a stroll along the beach at Acharavi and don’t stop till you get to the resort of Roda, a couple of kilometres to the west. For peace and tranquillity, hire a bike and head to the tiny but peaceful cove at Aghios Spiridion. The village of Old Perithia is a real-life ghost town set loom up on the slopes of Mount Pantokrator. Virtually deserted and eerily quiet, visitors can wander through street after street of empty Venetian houses and try to imagine a time long ago when it bustled and buzzed with life and people. For centuries, the area was densely populated because its remote position made it a haven from pirate raids but as towns along the coast sprang up, Old Perithians moved out to head for the bright lights. Though you might be short of company here, you won’t go hungry or thirsty – there are two friendly tavernas to make sure of that. Ignore the unattractive telecommunications station and giant radio masks at the top of Mount Pantokrator and enjoy the tiny monastery you’ll find there – as well as the spectacular views over Corfu, Albania and the Greek mainland. Atrapos is a good place for a broad selection of goods, everything from unusual orange and blue bowls and jugs to fish platters, bronze candleholders, backgammon sets and puppets representing characters from Greek mythology. For both modern and traditional gold and silver jewellery try Dala’s Gold. Both good quality china and hand embroidered tablecloths at prices that won’t bust the bank are available at Mary’s Shop. Beautifully crafted hairslides, bracelets and bowls carved from olive wood are on sale at the aptly named Olive Wood House. The local supermarket offers a good range of fresh local produce. Just bring a bottle – an empty one – to sample its home-made wine at a bargain price. Roda has grown from a quiet fishing village into a pleasant resort with a long sand-and-pebble beach and safe bathing. It’s an easy place to chill out but there are watersports, pony trekking and excursions for those who can only take so much sun-bathing and relaxation. By night, Roda has some seriously lively bars which stay open ’til the early hours. 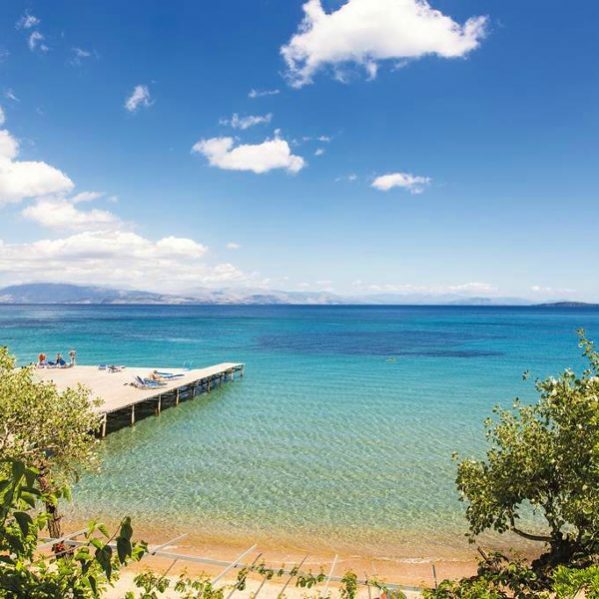 Jump on a boat and take a trip to the stunning sandy beaches of Erikoussa island or hit Corfu Town for sightseeing and shopping. The coastal road to Kassiopi – with olive trees on one side, jagged rocks over the sea to the other and the forbidding coast of Albania looming in the distance – provides a spectacular and dramatic car or bike ride. Meander down to Agnos beach on a sunny pony trek through country lanes and olive groves. Step back into old world Greece with a walk through the hills to the villages of Sfakera, Platanos and Nymphes. Or stroll along the nudist beach to Almyros. If your holiday coincides with one of Roda’s summer festivals, do try to get along. Theyare held in the nearby villages of Nymphes, Karousades and Episkepsi with details advertised on posters around town. There are plenty of good places to eat in Acharavi, mostly found on the main street, but you don’t have to wander much further to find Romeo’s on the road leading to the beach and Whispers and Hole in the Wall on the old village road. It may be big but beachside restaurant Maistro is far from impersonal and the fresh fish makes it well worth a visit. Traditional Greek dishes like stifado (a slowcooked Iamb casserole) and swordfish steak top the menu at the family run Nautilus restaurant which also boasts a boat-shaped bar. This place is a favourite with children – the swings, see-saws and giant ice-creams make sure of that. A varied menu with everything from fresh lobster to souzoukakia (Greek meatballs) and mezedes (small plates of delicacies including squid taramasalata and humus) makes The Pumphouse a good place for a blow out at reasonable prices. Bootleggers’ serves excellent pizzas in a friendly atmosphere. For Greek food cooked as the Greeks themselves like it. try the traditional taverna Drosia’s. Look out for the enormous chargrilled steaks and powerful tzatziki (a cucumber, yoghurt and garlic dip). The Gallery is run by an English couple who pride themselves on their cooked breakfasts. Overlooking the sea, they also have a range of reasonably priced snacks. The owner of New Port is known as ‘The Captain’, a larger than life character who makes dining here an experience. With gentle jazz and a sea view of the Albanian coastline, it’s a pleasant spot to tuck in to Greek and international dishes. Nikos Bar is the perfect chill-out zone-friendly but peaceful. There are no frills at Pancalos, a simple, old-fashioned taverna housed in Roda’s oldest building. Even so, the experience is memorable – sit at one of the tables on the balcony overlooking the sea and enjoy the freshest sole, lobster or giant prawns yowl l ever taste. You’ll have a laugh at Roda Park – owners Steve and Kostas will see to that – but you’ll also find excellent Greek cuisine including mezedes, a lovely dish made up of pork, ham, cheese and mushrooms in wine sauce and tender chicken baked in a parcel with potatoes. It’s in the Old Town. Listen to the waves break on the beach as the sun sets at Roda Star, popular for its charming staff, well-cooked and reasonable food. The Tropicana has toasties, sausage sandwiches and pizza and the best Sunday lunch. In Archaravi the main focus of evening are based around the local tavernas and bars. However, there are z discos in the area for those who wish to carry on the Greek Party. There’s a twice weekly Greek evening at the Taverna Palm Tree where Dinos makes sure the fun – as well as the food and drink – never stop. Time your meal at Valentine’s just right and you can watch the sun set over the sea as you enjoy polished service and high quality food. The nightlife in Roda consists of a few small discos and a plethora of music bars, which are open until the early hours. Emma and husband Shaun are always ready with a smile and a joke-making Cheers a friendly place to while away an evening. It’s in the old village. Greek law dictates that clubs can’t play loud music after a certain time but this doesn’t matter at The Drunken Sailor. Its soundproofing is so effective, it simply shuts its doors and turns up the volume anyway. One of the liveliest clubs in Roda, where you can dance ’til dawn. The British-run pub, Maggie’s Place, plays cool 1960s music and serves great bar meals as well as home-made cream teas in the afternoon. Its trivia quizzes are a big hit with the 30-plus crowd. You’ll see Greek dancers literally playing with fire at Mistral’s, a bar which adapts to match the needs of holidaymakers as the day unfolds. By day, it serves snacks and shows films. In the evening cocktails are its trademark. At night it becomes a buzzing dance bar. Small and cosy, the Roundabout Bar at the Roda cross-roads is popular with families. so flat shoes are highly recommended. Alternatively you can take a boat trip over to the Diapontia Islands. There are no road names in Aghios Stefanos, but the main road to Arillas Is where you will find the majority of the bars, tavernas and restaurants. There a re plenty of restaurants to try out, if you love fish why not try Margaritas, or visit the Sunset Taverna and enjoy their traditional Greek cuisine. There are a number of local bars that provide evening entertainment such as the Athens Bar, which is full of life, wacky and fun, or the Perms Pool Bar where a Greek dancing and barbecue night is held once a week. Lie on the pebble beach at Gouvia and gaze at the whitewashed church of Ipapanti Church opposite. Kontokali boasts an incredibly clean sand and pebble beach which is cleared of weed and rubbish early every morning. It has been given EU Blue Flag status and has sunloungers and parasols for hire. 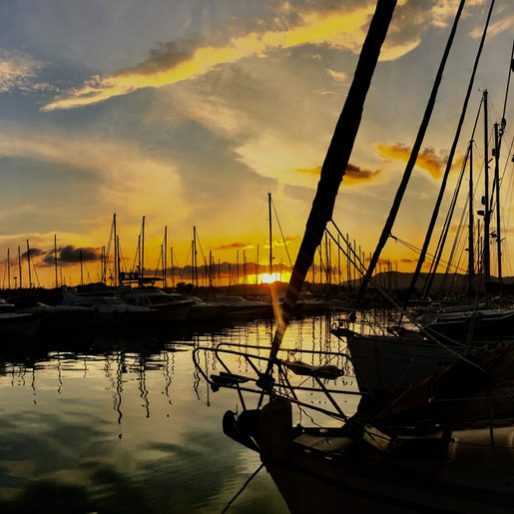 Home to Corfu’s largest yachting marina, Gouvia and its next door neighbour Kontokali (also with its own marina) attract tourists from all over the world. The British, American and Germans love it here, as well as the Greeks themselves who come in droves to enjoy the international atmosphere. 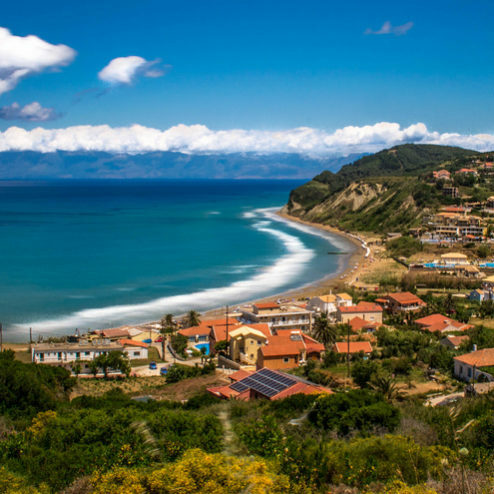 Within easy reach of Corfu Town, it’s also ideally placed to plan a trip to the famous beauty spot, Paleokastritsa, a stunning village surrounded by dramatic wooded headlands. Head out on the road to Kommeno to find Ipapanti Church perched on the end of a narrow causeway jutting out into Gouvia Bay. Built by the son of a Cretan aristocrat in 1300’s, it underwent extensive restoration work in 1996. The church’s feast day is marked by two festivals on 2 February and 17 july. The Lagoon offers great family fun with a lovely swimming pool, polished bar, crazy golf, five-a-side football and lots of facilities for children -and all for a small entrance fee. There’s live music in the evening and various organised activities. Open gam to 7pm and 8pm to midnight. The shops here offer plenty of choice and you’ll find lots of jewellery, clothes and leather. For high quality Italian goods at bargain prices try the leather warehouse, at the far end of Gouvia (towards Dassia). With its prime position overlooking the marina, Argo’s is a sophisticated restaurant with an upmarket menu and extensive, if expensive, wine list. Sample Greek and international food, including hamburgers and sandwiches, as well as Greek dancing (three times weekly) at Molfetta Taverna and Beach Bar which overlooks the bay at Gouvia. For English food plus a game of pool and darts try The Locanda, a friendly British-run pub which serves the odd Greek speciality too. Fish couldn’t be fresher or more deliciously cooked at O Makis. Settle back on the long established Pipilas’ shady veranda and enjoy authentic Greek and Corfiot dishes in a laid back atmosphere. Zorba’s Taverna serves everything from English breakfast to good grilled fish in a lovely setting – complete with geraniums, a palm tree and Greek dancing once a week For a wider choice of eating places, take a half-hour stroll to Kontokali. Archies In Kontokali is loud and bustling-with alive DJ, karaoke and dancing. The Beer Bucket is no place for the shy and retiring. There’s live rhythm and blues bands once a week, gallons of draft beer, dancing on the bar and lots of laddish behaviour It’s in Kontokali. The King Size, Prince in Gouvia fills up quickly with those keen to hear the English DJ play some great music. Treetops in Gouvia has excellent music and friendly atmosphere. Trax In Kontokali is a relaxing place for both couples and families to chill out, sip a cocktail or two and enjoy the warm welcome of owner Spiros while unwinding to jazz, reggae and soul. Whispers in Gouvia attracts a mostly young crowd. The music pub Melodies in Gouvia has great cocktails served by a flamboyant barman. Nissaki Bay is a tiny white-pebbled cove tucked away at the bottom of a steep hill off the main road. It is the smallest of the three beaches. A very steep road leads to Kaminaki Beach where you will find limited parking or stroll down through the olive groves that begin at the main road. It’s worth the effort as the exceptionally clear waters make this a superb place for snorkelling. The Iong, pebbly Krouseri beach has watersports, boat trips and sunloungers. The steep slopes of the imposing Mount Pankokrator rise above the fascinating stretch of coastline which is home to the quiet resort of Nissaki. The pace of life is gentle and restful here, a far cry from the disco bars and bustling nightlife you’ll find in other parts of the island. A handful of restaurants and shops dot the landscape and three beautiful, Descent-shaped white shingle beaches offer watersports to make this a perfect place for a peaceful escape. Supermarket Afrodite has all the fresh food and groceries you’ll need, as well as a great bakery next door selling tempting bread, cakes, biscuits and feta pie. It’s on the main coastal road about 100m after the church. The Olive Wood Shop’s beautifully crafted salt and pepper mills are polished by hand in its workshop. It also sells photo frames, chopping boards, huge decorative forks and spoons and candleholders. The Loom in Nissaki Bay is an Aladdin’s cave of treasures all contained in a low-beamed room with house-martins nesting in the eaves. Here you’ll find ceramic trays and dishes, hand knitted jumpers, rugs, toys, dolls and stuffed donkeys. You can tell Dimitris’ Restaurant in Kalami is run by a Greek chef by the fantastic food served up – including souvlaki, lobster and oyster mushrooms. On the main road towards Kassiopi, it has stunning views over Kalami and is great for a special occasion. For a good lunchtime moussaka, or plate of pasta with an unbeatable sea view, head for Mitsos which also opens for dinner. It’s in Nissaki Bay. The Olive Press Taverna may take a little finding – it’s tucked away at the far end of the village – but it’s well worth seeking out. Not only does it have a lovely sea view and serves excellent Greek food, Phillipos and his wife will do everything they can to make sure you have a lovely night. The Taverna on the Rocks has a pleasant veranda overlooking the bay and an ambitious menu featuring swordfish, sole, grilled prawns and mussels – as well as meat dishes. A friendly atmosphere, sea view and good food make Vitamins Taverna a popular venue. It’s near the Olive Wood Shop on the main road towards Corfu Town and is open from 10am to midnight. 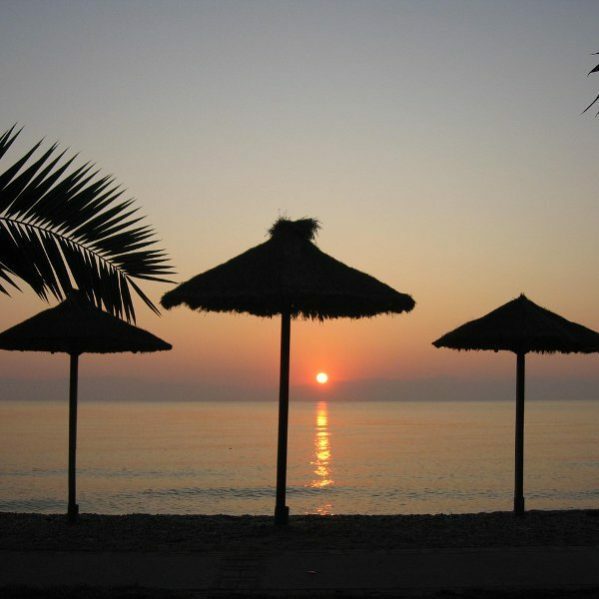 Nissaki is a quiet and relaxing resort – with the nightlife revolving around the small and friendly bars and tavernas.